Something Spooktacular is going on at Berkeley Castle this half term, with frighteningly good fun to be had by the entire family. 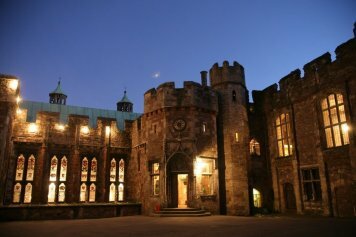 From the 21st to the 24th of October, everything from spooky stories to pumpkin carving will be available in the castle, which has been home to the Berkeley family since the late 12th Century. Throughout the week, activities such as toasting marshmallows around the fire in the woodland grove and meeting the wizard with his wise owls in the Great Hall will be available from 10.30am with the last entry at 5pm. Should you miss the opportunity to enjoy these ghostly goings on, you can still visit the castle from Monday – Wednesday until the end of October and enjoy the walled garden, butterfly house and of course the historic enchantment of the castle. Why not take a wander along the ancient corridors on Hallows Eve itself and keep your eyes peeled for any spooky spectres! 2018 admission prices are £12.50 per adult and £7.00 per child with concessions available. For more information please visit the website here. Whilst you’re in the area, you may also enjoy a trip to the nearby Burford Garden Company, where you can shop for exquisite antiques and visit our show site, where there are up to 25 display buildings and a team of friendly advisors on hand to help.